NEW ORLEANS — How strong are the finalists for the 2016 version of The Bowerman? It’s going to make the voters’ jobs incredibly tough. That’s why we’re asking for your help once again. 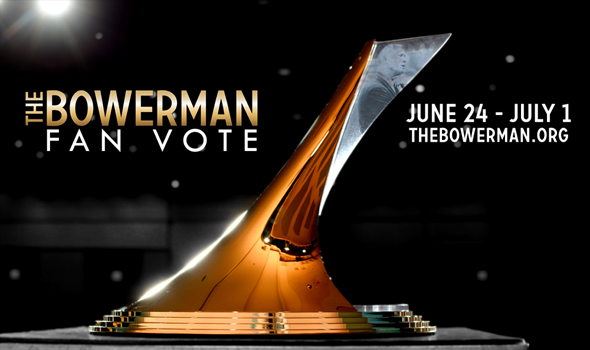 Today marks the start of the annual Fan Vote component of The Bowerman selection process. It runs through July 1 and is open to anybody in the world with a valid email address. You may vote up to five times per day (per gender) from the same email address, regardless of device. “The Year of the Vault” captured the public’s attention in 2015 as Akron’s Shawn Barber and Stephen F. Austin’s Demi Payne each won the fan vote. More than 50,000 votes were cast last year as Barber and Payne got a head-start on the rest of the finalists. Who do you have a chance to vote for this year? Texas A&M’s Donavan Brazier: The freshman phenom ran the fifth fastest time over 800 meters in collegiate history indoors (1:45.93) and then broke Jim Ryun’s 50-year-old record outdoors (1:43.55) on his way to the NCAA title. Oregon’s Edward Cheserek: The first three-time finalist in the history of The Bowerman added four more individual titles (five total) to his legendary haul and became the first man since Galen Rup to wear all major distance crowns in the same academic year (3000-5000-DMR-5000-10000). Arkansas’ Jarrion Lawson: The Razorback joined Jesse Owens as the only men in NCAA history to complete the long jump-100-200 triple at the NCAA Outdoor Championships (Owens did it twice) and broke the modern-day scoring record at the meet with 31.5 points. Lawson also won the indoor long jump title and placed fifth in the 60. Texas’ Courtney Okolo: She was the Queen of the Quarter Mile in 2016 as the Carrollton, Texas native swept the 400-meter crowns and anchored two winning 4×400 relay teams. Okolo lowered her outdoor collegiate record to 49.71 and became the first woman in collegiate history to go sub-50 seconds. Georgia’s Keturah Orji: Collegiate records weren’t enough for her this year, so she set her sights on the American record. Orji dominated the triple jump this season and swept the slate clean (indoor/outdoor) and broke the outdoor collegiate record and set an American record in the process at NCAAs. Mississippi’s Raven Saunders: She set the indoor and outdoor collegiate records in the shot put, of which the latter stood for 33 years before she turned it to dust at Hayward Field. Once fans cast their vote, they can spread the word about their favorite finalists and encourage others to do the same. Share the voting link and use the following hashtags on Twitter, Facebook and Instagram to promote your favorite finalists (Posts do not count to the overall vote total). Online fan voting started in 2009 with more than 250,000 votes having been cast since. Winners of the fan vote receive a first-place vote to their overall total. Paper balloting by The Bowerman Advisory Board, past winners, selected media personnel, statisticians, and collegiate administrators is also underway until August 2. An independent accounting firm will collect, tabulate, and certify final results and will keep the result secret until the envelope is opened in December. Remember: Only consider performances that occurred from the beginning of the indoor season through the end of the NCAA Division I Outdoor Track & Field Championships. Any performance that occurred during that timeframe — even if it wasn’t a purely collegiate competition — can be counted, like the IAAF World Indoor Championships. Anything before that time (cross country) or after (U.S. Olympic Trials, select Diamond League meetings, etc.) should not factor into the decision.